Challenge your distance training and complete a 10k workout! Swimming on your own can be tough. 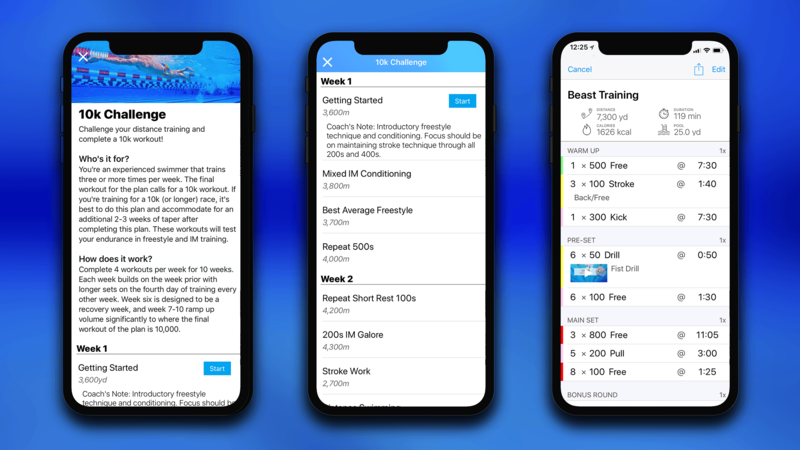 This 10k Challenge Training Plan is the most advanced training program in the MySwimPro app and will test your mental and physical endurance. The workouts in this plan are comparable to training sessions completed daily by elite distance swimmers. The 10k Challenge Training Plan is designed for serious swimmers looking unleash their inner beast training! This plan is available exclusively in the MySwimPro App. Download the App for free on iPhone and Android to subscribe to a training plan that’s right for you! Who’s it for? You’re a experienced swimmer that trains three or more times per week. The final workout for the plan calls for a 10k workout. If you’re training for a 10k (or longer) race, it’s best to do this plan and accommodate for an additional 2-3 weeks of taper after completing this plan. These workouts will test your endurance in freestyle and IM training. How does it work? Complete 4 workouts per week for 10 weeks. Each week builds on the week prior with longer sets on the fourth day of training every other week. Week six is designed to be a recovery week, and week 7-10 ramp up volume significantly to where the final workout of the plan is 10,000. Setting Goals: Having a goal gives you something to work towards and a plan helps get you there! Having a chart makes your goal much easier and attainable. Staying Focused: By having a plan ahead of time, you know exactly what you’re going to do and when you’re going to do it. One of the worst things that can happen, is to only swim when the mood hits you (or not at all). A plan will keep you focused on where you’re going. Start the 10k Challenge training plan and elevate your swim training with MySwimPro! Still not convinced, read: Why You Need A Structured Training Plan.